Should real estate agents give appraisers “comps” at an inspection? To give comps or not give comps? That is the question. I met up with Realtor Steve Ostrom last week and we talked about whether a real estate agent should give an appraiser “comps” or not when meeting the appraiser at the inspection. Steve talked about why he always meets the appraiser at the property and I gave some tips for interacting with appraisers around this issue. Due to HVCC, there is still some confusion over whether agents can even talk to appraisers, but they definitely can (just don’t try to pressure for a certain value). Check out the video below (or here). Let me know what you think. I’d love to hear from other agents and appraisers especially. Any questions? NOTE: In quite a few cases the “comps” provided by real estate agents are really not all that “comparable” to the subject property. It can be valuable when agents share their market insight with appraisers, but my advice to agents is to make sure the sales really are comparable and located in the same market area. This comes back to the difference between a property that is truly competitive / comparable (“comp”) to the subject and a sale that meets a certain price level. I met up with Realtor Steve Ostrom the other day while at Real Estate Bar Camp Sacramento (a great event). Steve interviewed me and we talked about home owners getting an appraisal before listing a home, finding comps and other issues. Check it out and let me know what you think. Catch up with Steve and his wife Heather at www.rosevilleandrocklin.com or on Facebook or Twitter. Thanks so much Steve & Heather. I’m heading to an appraisal inspection shortly in Roseville and I wanted to share some preliminary research. I find it interesting to take a panoramic glimpse of citywide data like this. What do you see in these trend graphs below? What stands out to you? 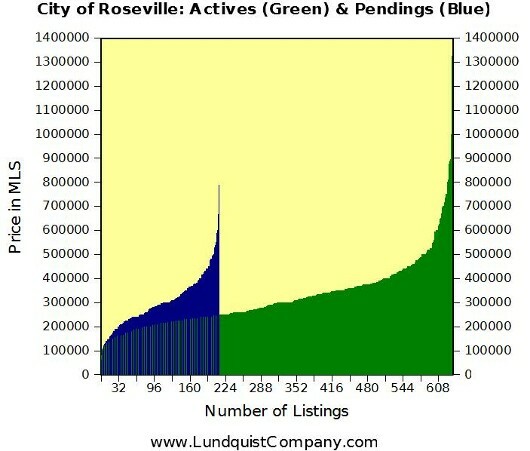 The graphs are based on all single family residential sales and listings in Roseville from Sacramento Metrolist. I’d love to hear your comments below. 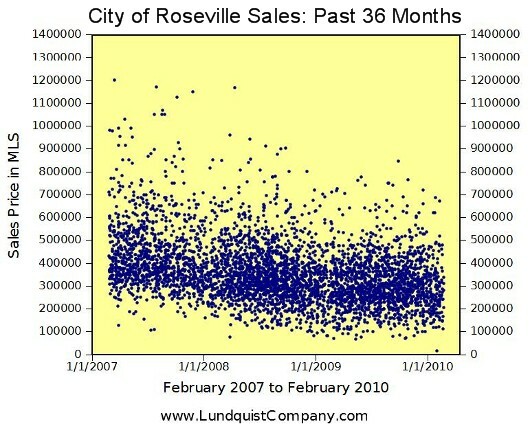 While on the subject of Roseville, I wanted to mention that one of my Twitter friends, Realtor Steve Ostrom of Coldwell Banker, posted an interesting video a couple of weeks ago about shadow inventory in Roseville and Rocklin. It’s interesting to look at what the numbers are saying. How many houses are in the process of foreclosure? How many loans have defaulted but not listed on the market yet? Statistics like this are very important to watch and they can be indicators of what is to come too. If you can’t see the video below, then click HERE.